It is not unusual to experience some losses when raising baby chicks or chickens. Following these instructions will help you provide excellent care for them so you can keep losses to a minimum. Space – allow about ½ square feet per chick. This space must be protected from drafts but also must have adequate ventilation. It should be protected from mice, cats, dogs, small children – anything that would cause the chicks stress. This includes noise – such as loud rock-type music. Chicks that are stressed are less likely to eat and drink and are more susceptible to illness. The area must be clean. If you have raised chickens in this area before, then the area must be throughly cleaned and disinfected. Old birds can leave droppings with bacterial or viral components that baby chicks are not ready to be challenged with. Coccidiosis can live in the droppings and in the ground for years. 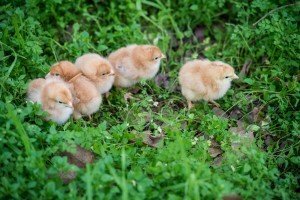 If you have had coccidiosis before, please use a different area for the chicks. Heat – plan for the area to be 95 degrees (F) when the chicks arrive, then drop the temperature 5 degrees (F) per week. Turn the heat on at least 24 hours before the chicks arrive so that the area is throughly warm. It takes a while for concrete, wood, bedding material to come to temperature. A 250 watt RED bulb is a good source of heat. It may be a bit too warm directly under the bulb, but the chicks should have enough room to self-adjust to the temperature. DO NOT TRUST a clamp to hold a light in place. ALWAYS secure it with wire or screws. The clamp will give way, the light will end up in the litter, and a smoky fire will result. Litter. Low-dust wood shavings are the best. Do not use cedar chips or sawdust or treated wood chips. Sawdust can be eaten and cause problems. The first day, cover the litter with paper towels, not newspaper. The paper towels must be rough enough that the chicks can get a good purchase on them (good traction) and not develop splay leg. Covering the litter the first day makes it so that the chicks don’t have to work to find their food. Feed – See the section below about “Chick Arrival.” The chick starter you use is extremely important to the chicks’ development. The first week of growth sets the stage for all future development. If a chick is nutritionally challenged the first week, it may never reach its full genetic potential. Many commercial chick starters are too low in essential elements – lysine, methionine, protein. Further, they may have sat on the shelf for a long time and become non-palatable. If you have a local feed mill, see if they will mill you a Fertrell-based chick starter. The Fertrell mix and associated recipes have been excellent. If you do not have access to such, you can contact me. I can send you enough to get you through the first several critical weeks. Water – See the section below on “Chick Arrival.” Use a 1 quart waterer for each 25 chicks. A quail waterer is ideal for the first week. Its narrow lip prevents the chicks from getting wet and saves you the trouble of dealing with marbles or pebbles. The water must never run dry. It can be useful to keep two 1 quart waterers available – so that they never run dry. A chick without access to water will suffer irreparable kidney damage within a very short time. The water must be kept clean. I prefer to fill the quart waterers ½ full instead of completely full. That way, I have to refill the waterers before they get dirty. It is critical that the waterer be cleaned each time it is filled. Warm water that was been exposed to chick litter is a great breeding ground for all sorts of problems. 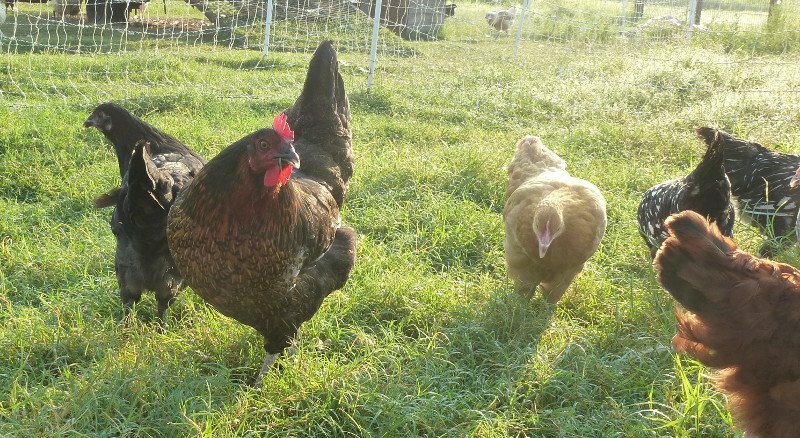 Dirt – Chicks need access to good, microbially-active dirt. Dirt from an active garden bed or a mature compost pile works well. I like to pull up a small plant and place it – top, roots, dirt and all – in the brooder for them to play in. In my questioning about the topic of pasty bottoms, this is the number one recommendation I’ve found to prevent it. Chick Arrival: The day that you think the chicks are arriving, boil 2 eggs in the morning or the night before. When you arrive home with the chicks, leave them in the box in a warm place. Prepare the initial water: 1 tablespoon sugar to 1 quart of water. Double the sugar if the chicks are a day late in arriving. Add 1 tablespoon of organic (Bragg’s) Apple Cider Vinegar to the water. The water should be warm – around 95 degrees. We do not want them to get chilled by drinking the water. Do not use any commercial electrolyte – they often don’t taste good and so restrict the chicks drinking. Plus they contain salt that can poison a young chick. On the paper towels crumble the two boiled eggs – shell and all. Then spread out 2 cups of ground corn, ½ cup chick size grit, and ¼ cup of chick starter. I spread it directly on the paper. If that feels too messy to you, then put it in an open egg carton. Take a chick from the box, dip it’s beak in the water until you see or feel it swallow. Then place it on the feed. Repeat until all the chicks have been watered. Some chicks will refuse to drink, put them back in the box so that they get another chance. WATER FIRST – then feed. The purpose of the corn is to give them an immediate energy boost. If the chicks are a day late – do the above – and do the following. Mix 2 tablespoons of sugar in 1 quart of water. Bring to a boil to totally dissolve the sugar. Once the liquid cools cools to body temperature, mix enough of it with chick starter to make a dough that is the consistency of wet cookie dough. Give 1 cup of this mixture per 25 chicks after 1 hour, and give each day for 3- 4 days or until you see the effects of the trip subside. After 12 hours, add more chick starter to the feed. At 24 hours, put ¾ cup of yogurt directly on the feed. The yogurt will help establish beneficial bacteria in their stomach. Items to keep on hand. Hopefully you will not need any of this. But if you do, it will be on the weekend when it’s hard to find.